• Didn't Get Your Dues Invoice? Holiday festivities at CIH got into swing on Saturday December 8, with the annual Parade of Lights. 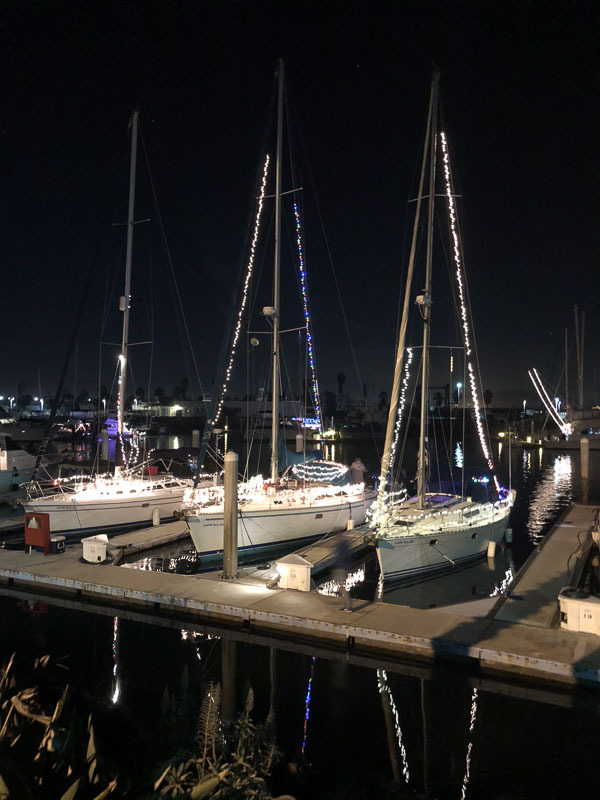 While no Fairwind boats took part in the parade several were dressed up with strings of lights and several skippers hosted members and their guests to lots of good food and holiday cheer as the parade went by. The night was fine and clear and everyone was on reasonably good behavior. First prize for decorations went to Geoff Warner on Sorella but the three lovely ladies on E dock, Wojo, Angelsea, and Mistral were a close second. The Boat Selection Committee at MDR has been very active this month. A supplemental survey asked the membership about preference for a monohull or a cruising catamaran. Not surprisingly the latter is favored by many due to the greater comfort it may provide at anchor or mooring but generally speaking a lot more money is involved so the Committee is still wrestling with what to recommend as the best choice for the Club. On the subject of cruising something else is in the works at CIH as a result of conversations between Mike Delaney and the Nature Conservancy. The Nature Conservancy manages about 75% of Santa Cruz and until now we have not readily been able to have members who cruise to the islands be able to land on Conservancy land without getting individual permits each time. 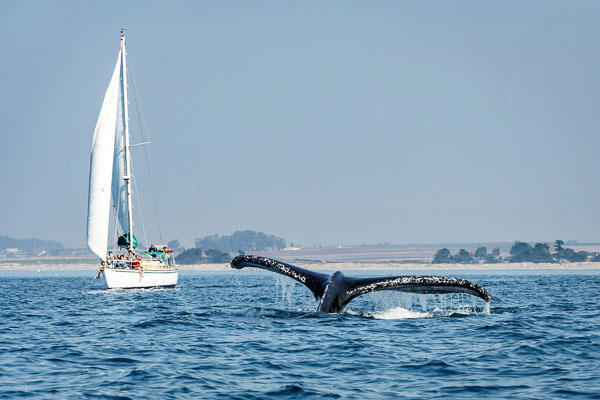 Mike has negotiated a yearly boat permit agreement that will open up possibilities for introducing more variety into the Club cruises and will allow sailors on personal cruises to land on, hike and explore the conservancy lands at several of the Santa Cruz anchorages. Details are being worked out. I would like to thank Lorelei Woerner-Eisner for her efforts in spearheading the collection of contributions for the victims of both the Borderline Bar shootings and the Woolsey fire. It’s never too late to contribute and I suspect the needs of the victims will go on long after the events have gone from the immediate memories of those not directly affected. A special end of the year thanks to all the volunteers who keep our club going and thriving, and a special wish to all our members for a very healthy and happy New Year. Alan MacGovern was born in Dublin, Ireland and educated at Trinity College in Dublin, where he got his Masters degree in Physics in 1962. Married to Elizabeth (nee Tweedy) since 1963 ; three sons. They moved to the US in October 1966. Alan worked in aerospace optical systems at Itek Corp. and Rocketdyne/Boeing and is currently retired. 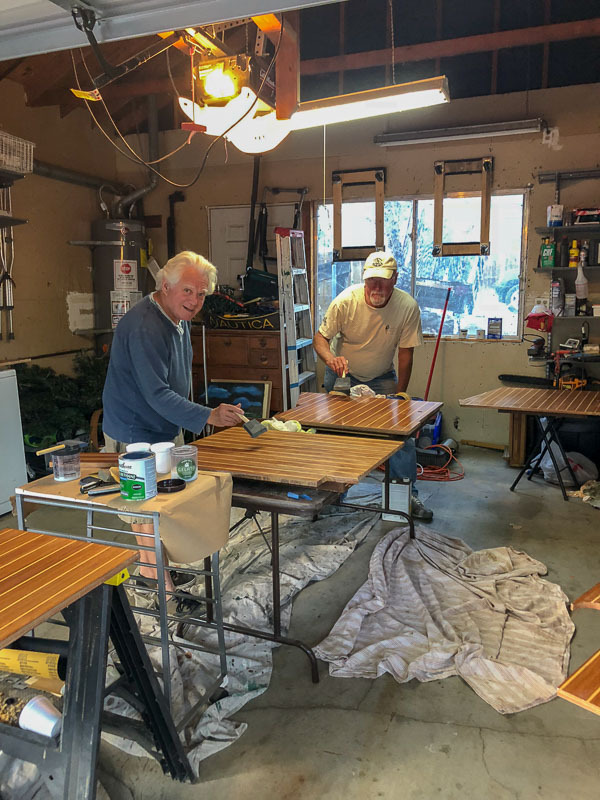 Peter Granet and Mike Delaney making Mistral's floorboards beautiful again. Wishing all members a great New Year! Stephen Fenster is the Rear Commodore for FYC MDR. He holds a BA in Education and has spent his professional life in the marine and automotive aftermarket. He serves on the Fairwind Board, the Harbor Committee and the Boat Selection Committee, and is responsible for all outboards. He has been married for 39 years and has one child. 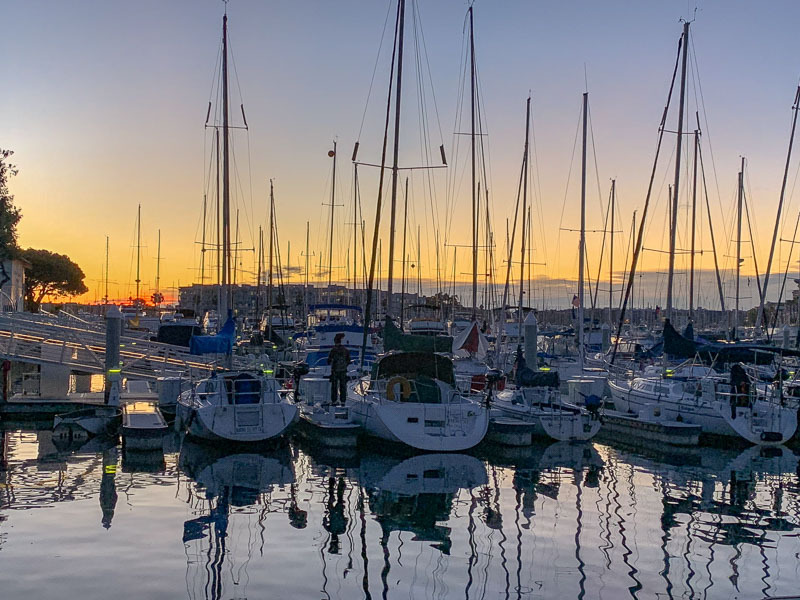 Welcome to 2019 already---and we've got a list of dates that we've reserved for Channel Islands Harbor Club Cruises. We are expecting a high level of participation again this year for these eagerly awaited cruises. One of the great benefits of FYC are our Club Cruises. Club cruises are an excellent opportunity for club members to spend the weekend sailing with other club members, overnight in pristine and beautiful anchorages, and increase our sailing knowledge in a really fun social setting. This is also a great opportunity for our newer members, particularly those who have not experienced a cruise to the islands, to cruise with an experienced skipper and crew. And for our more experienced members, it is a great opportunity to start new friendships, rekindle old friendships, and impart some of our knowledge to the less experienced--as we have been given that experience by others over the years. Here's the schedule for the year, so please put the dates on your calendar in advance. A month before the cruise there will be a general announcement by email and at that time please let me know if you'd like to sign up as skipper or crew. I've had a number of requests to schedule a 4 or 5 day Club Cruise to circumnavigate Santa Cruz Island or even head over to Santa Rosa Island. I'd like to gauge interest---if you're interested in a longer duration cruise please email me and tell me your preferred month. Our Club cruises are in line with our By-Laws, which in Article II Objectives state that among other things, one of the club's objectives shall be to sponsor sailing-related social and cruise activities for its members and guests. If you've got any questions, comments, to sign up, or just to simply say hello, please email me at: scottmkelly@aol.com. What's better than a weekend cruising our beautiful Channel Islands! Scott Kelly has been a member of Fairwind CIH since 2009. He was on the Board of Directors as Fleet Captain 2011-2012, Port Captain 2016-2017, and Commodore 2016-2017. Currently CIH Cruise Chair. He is an ASA 201, 203, 204, 205, 206, 214, and 218 Instructor. He is also certified as Master Scuba Diver, surfs, and is happiest on, in, or under the water. We have an exciting cruise season ahead. In order to allow most individual members unfettered access to the large boats in the fleet during high season, most of our cruises have been scheduled to take place in the offseason, except for the Independence Day week cruise, which however takes place during weekdays, leaving the 4th of July weekend available for family and friends cruising. We are particularly looking forward to the May cruise coinciding with the Art Deco Society Ball at the Avalon Casino, and the always fun Buccaneer Weekend cruise in October. Arlene de Anda joined Fairwind in 2013 and has served as the MDR Cruise Chair since 2016. She enjoys the cruises’ camaraderie with the club’s wonderful members. In her work, she partners with programs like Newport Sea Base and Mission Bay Aquatic Center to offer unique learning experiences for students K-12, including learning how to sail. We’ve had three incidents in the last couple of years in MDR with Capri 22s crashing during a high wind condition. The most recent one was this month. One of our members went out around noon with a wind report of 6-10 knots, which became 10-15 gusting to 20 in the afternoon. There was no small craft warning at the time the member went out. The Sheriff station put out a GALE warning after 1 pm and actual gusts went up to 35 knots with white caps inside the marina - when it was dead calm two hours before. During the sail, they suffered an engine failure and could not successfully furl the jib or reef the main. They collided into an empty slip at the sheriff station. The sheriff boats were busy rescuing other boats in distress and allowed them to stay till the following day. The member offered to pay Vessel Assist to tow them back for $280, but fortunately, we were able to restart the engine and motor back in the morning. So what do you do in a situation like this, with sudden high winds and no engine? Boat Chief Uta Buschor examines the mainsail ripped during sudden gale-force Santa Ana winds in MDR. 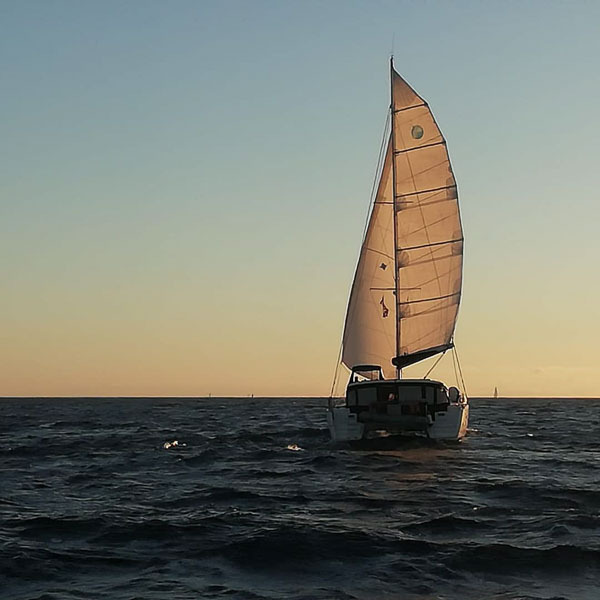 In a high wind situation, tacking becomes difficult because if you have too much mainsail, you have too much weather helm which prevents you from falling off to complete the tack. One thing you could do would be to un-sheet the main out once you pass through the eye of the wind, and keep the jib backwinded to help you fall off. Another tactic is high wind jib. This is a high skill level maneuver, and not for rookies. But then if you are going out in weather, you should not be a rookie. The last resort is to throw out an anchor and ride it out. Fairwind rules do not allow boats to go out during small craft warnings. But sometimes winds do come up without warning, especially in the winter when Santa Ana conditions develop. Listen to forecasts and pay attention to possible predictions of Santa Anas. If you have a Westerly wind that dies around 2:30-3, it’s an indication that the wind is clocking to the north and it could blow hard. Head for home. Practice reefing and reef early, it’s always easier to blow out a reef than to reef under heavy seas. Have your anchor ready. Go out with experienced crew, not with other rookies or trying to single-hand. Sometimes, we have a small craft warning and very little wind. This happens more in MDR than CIH, so we go out in spite of the SCW. If you do just remember to be ready in case the weather changes. Art Toye got his first certification as an instructor in 1988 and taught beginning through advanced sailing at UCLA Aquatic Center in MDR for 30 years. He most at home day sailing and increasing his skills doing cruises. It started as a dream so many years ago. We called it our 5% dream as we really thought there was only about a 5% chance it would ever happen. Then one day our fourth-grade son Ryan showed us a picture he'd drawn, a Lagoon 400 with all of us on board. I looked at my wife Andrea and the dream shifted toward reality. We flew to Greece and bought a boat in October 2017 then spent the next 9 months preparing to leave. We named the boat Field Trip as our last name is Field and we decided we'd take the kids on a little field trip. May 15, 2018, I quit my job and June 1 we boarded our new home. 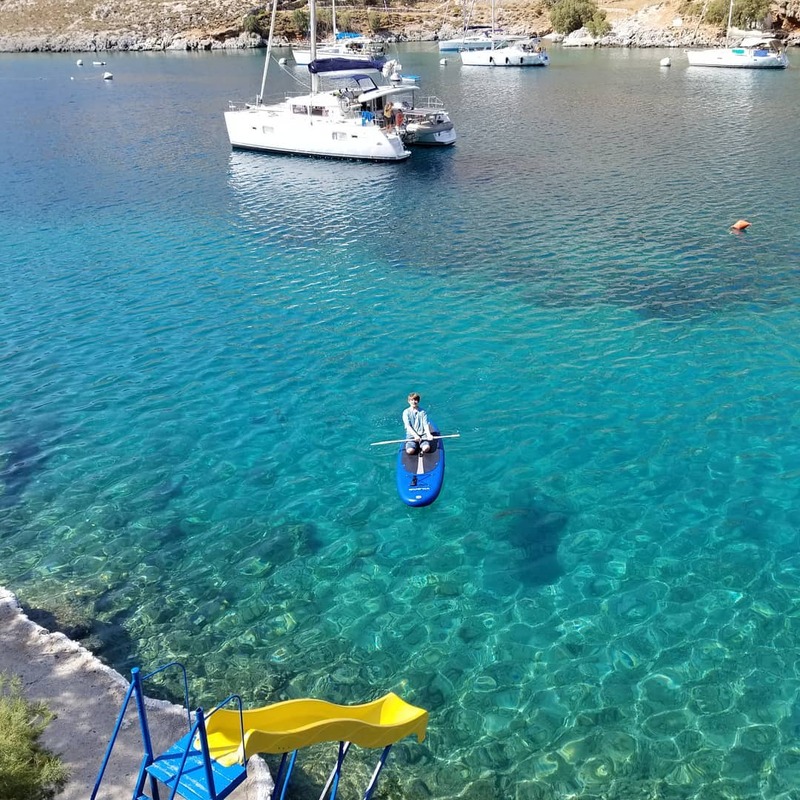 I did what Zac Brown did in his famous song, I left a post-it on my computer that said, "wrote a note, said be back in a minute, bought a boat and I sailed off in it..."
Field Trip in the background, in Kalymnos, Greece, and Ryan Field on the paddleboard. I've sailed the reverse Transpac and we've been sailing monohulls to Avalon with FYC for a few years, but we'd never sailed a 40-foot cat before. It turns out that it's not as hard as you'd think. Two engines make turning and docking a breeze even in 20+ knots and if you follow the reefing schedules you have no problem with sail plans. 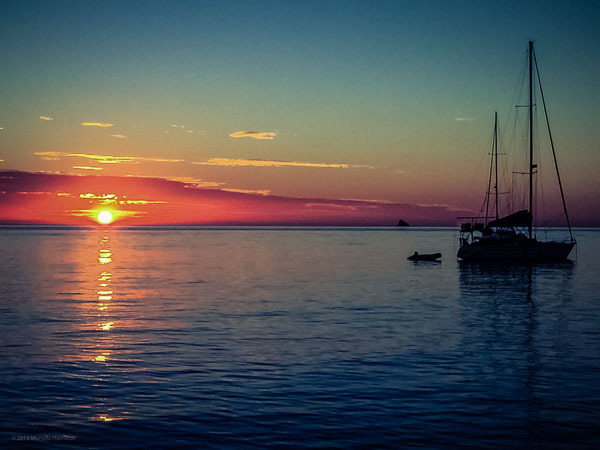 We spent June sailing around Greece and July sailing around Montenegro and the islands off Croatia. August found us in Venice for 10 days because I've always wanted to sail my own boat into Venice. The kids moved from an abbreviated school curriculum to a more substantial onboard schooling program as we left Venice and sailed down the Adriatic. The four-night passage under the Perseid Meteor Shower was totally unexpected as was the full lunar eclipse the month before in Croatia. The wind didn't show up as predicted so we threw dock lines out the back and let the boat pull us along at about 1-2 knots on a totally flat sea. I also took this opportunity to scrub the hull. Now that I think about it, wow! Middle of the beautiful blue Adriatic with a hot sun and I get to clean the bottom of both hulls - cool. We sailed through the Messina straight up to the base of the volcano on Stromboli arriving at 3am to see lava flows lighting up the night sky. The next day we climbed the volcano and got the close-up, one of the greatest experiences of our lives. We sailed to Naples and were hit with a storm that packed a 60-knot punch with 3-meter short period waves, but our little Lagoon took it in stride quartering the waves beautifully. We moored in the Tiber river outside of Rome in September and ventured out by car on a 3-week road trip of Europe to include visiting Tuscany, the Alps, Paris, the beaches of Normandy and friends in London. Wherever we traveled we'd take side roads and dirt roads to see the parts of Europe most people never experience. Mike Field has been sailing since 1989. In 1999, John Jourdane invited him to deliver Medicine Man, a Transpac Race Boat, from Hawaii to California. He joined FYC in 2010 and holds ASA 101, 103, 104 and the USCG 105. He worked in the finance industry as a regulatory compliance officer. His wife Andrea has been sailing and racing since childhood. There's an adage in boating: "Never approach a dock faster than you are willing to hit it". And another one: "Go as slow as possible and only as fast as you have to". The "only as fast as you have to" part is to maintain steerage, but no faster. You can always add speed by shifting into forward, then neutral, no throttle. 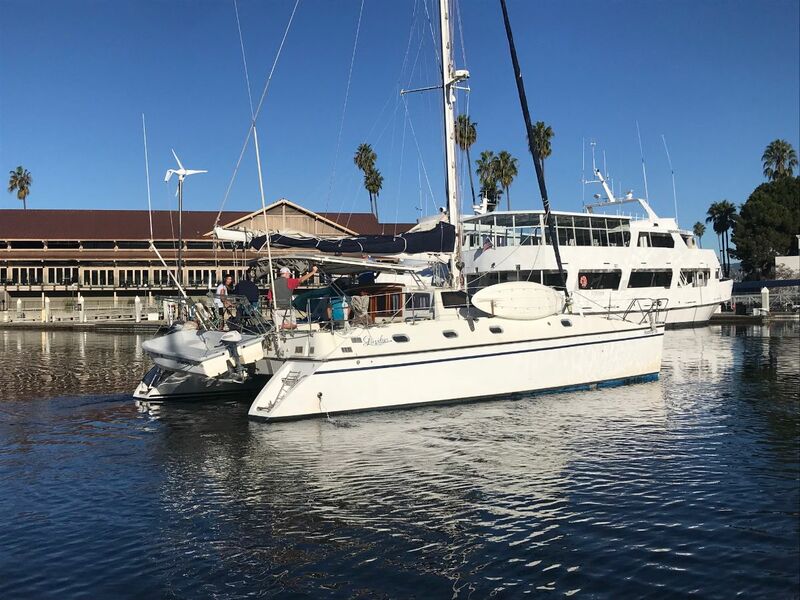 I don't know if this technique is being taught in Marina Del Rey, so I'm going to mention it: when docking, your boat should be stopped when the beam enters the slip. No further. Your boat should be in neutral, with a possible short burst in reverse if necessary to stop. It should not normally be necessary. At this point, one or two able-bodied crew should disembark at the beam onto the dock staircase and make ready dock lines. At FYC MDR, this also means that someone should step off the boat with the bow line in hand. Next, the skipper should shift into forward, then neutral. Repeat if necessary. No throttle, unless very windy from the bow. If the wind is from astern, stay in neutral or reverse, no throttle unless very windy. FYC docking slips at Marina Del Rey harbor. For boats with marine outboard engines, they should also be stopped when the beam enters the slip, crew disembarks, and then the boat should be pulled into the slip the rest of the way with the bowline due to the undependable nature and awkward and/or imprecise operation of an outboard engine. Try not to hit the dock or dock box or piling. As of a year ago, state law requires skippers of boats with engines to possess a Boater Safety Card while operating a boat. It is being phased in on the basis of age, with those under 25 being affected in 2019, but up to age 35 in 2020, and 40 in 2021. To qualify for this lifetime state-issued card, one must take an approved educational course. Currently, there are online options that are free of charge, but most of the courses charge around $30 and may require extended classroom time. ASA certification, even at the instructor level, does not qualify, and approved courses must have been taken within three years of application. I have taken the free online course, which takes a minimum of 3 hours to complete. I was surprised at how many details involving maritime law I had forgotten, or have changed since I went through my training. It is a good refresher. Although there are free options now, I expect that they will disappear over time, as generally, government created options are discouraged from competing with commercial businesses. So you might want to consider taking this course now while it is free, than getting stuck later. I hope all of you had a Merry Christmas and that it will be a Happy New Year. Thank you for your support in electing me MDR fleet captain. I have attempted to hit the ground running and would like to update you on what’s been going on. First, we updated the new trainer and instructor list on the Fairwind website. 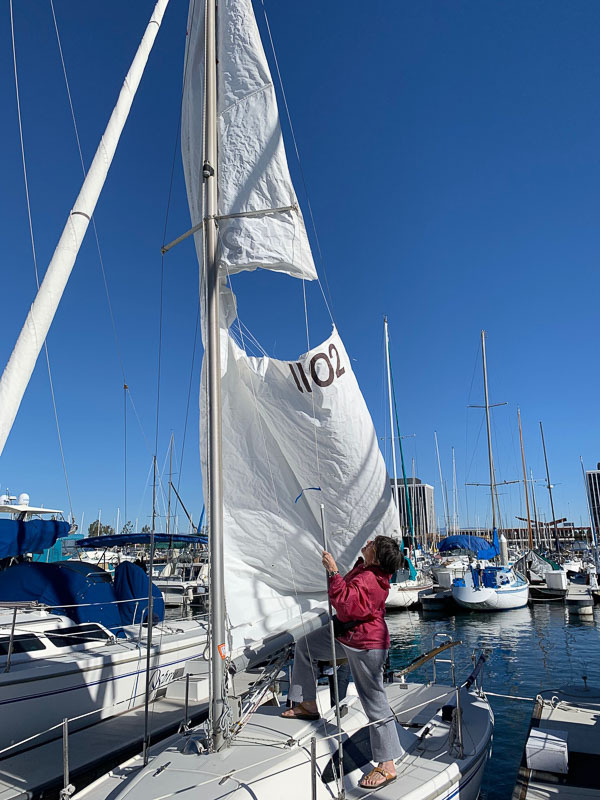 Also, as covered in the last newsletter, we sponsored an ASA 201 clinic for new certified instructors with seven students, and conducted an extensive ASA 104 class which included a three-day cruise to Catalina and Redondo Beach in addition to four separate training days. In December, we sponsored an ASA 114 cruising catamaran class headed by Lori Klaidman on a 39-foot cruising cat. I initially expected the usual four to six members to respond to the first email I sent out in October, but we ended up with 35 new ASA 114 certifications. Congratulations go to Lon Cohen, Mackenzie Sullivan, Willy Maynetto, Harvey Chao, John Lee, Art Toye, Bruce Byall, Kuba Fietkiewicz, Hank Gifford, Carl Schwenk, Mark Salkin,Terry Keller, John Mudgett, Pawel Sobierajski, Marek Niklas, Benjamin Lish, George Westerdahl, Bruce Naliboff, Rick Luckey, Julie Miller, Andy Ketchum, Alex Van Name, Spyro Spryropoulos-Spears, Roger Vetruba, Karl “Skip” Korsgaard, Patricia Rose, James Preischel, Ron Knight, Jonathan Braun, Wing Ping Chu, Alex Case, Mark Levine, Michael McKinsey, and Mark Watkins. New members will need to start training on either Rambaley or Seaweed as their first checkout boat. They will need to complete the ASA 101 written exam before training. Upon checkout, they will get their ASA 101 certificate. Docking and undocking the Capri 22s in MDR will include practice under sail in the event of an engine failure. The ASA 103 written test will need to be completed before the start of training on medium boats. The first medium boat training will be on Frequensea. Trainees will get their ASA 103 certificate once they complete their first medium boat checkout. MDRs ASA 104 weekend checkout will be more like a checkout, in that the emphasis during the weekend will be more about demonstrating your cruising skills and less about training. This means ASA 104 skills have to be learned through either self-study or ASA 104 mini training sessions. It will be similar to the way we train ASA 101 and 103, where the training is separate from the actual checkout. Also, students must be checked out on the boat they are training on. Since most students are only checked out on medium boats, it is likely the ASA 104 checkout will be done solely on medium boats. This also means much of the training for systems, maneuvering, man overboard, anchoring, etc. will already have been learned. Art Toye got his first certification as an instructor in 1988 and taught beginning through advanced sailing at UCLA Aquatic Center in MDR for 30 years. He is most at home day sailing and increasing his skills doing cruises. Statements for January dues went out the morning of December 18. Every Crew, Small, Medium and Large boat member should have received a statement showing the current charges and the total due. Intuit, the maker of Quickbooks, used to provide an email service that proved to be very reliable. Unfortunately, they have decided to discontinue this service and we must rely on sending statements via gmail. In the past, some email providers blocked mass emails. So members that used AOL, HotmaiI and msn may or may not have received the statements. Uta Buschor joined FYC in 2014 and has assumed the billing/collection function for the club since then. She holds ASA 101, 103, 104, 105, 114 and 201 certifications, is the boat chief for Generosity and enjoys training and checking-out club members on Rambaley and the Capri 22s. - If you wish to purchase a Parking Pass, you may do so for $50.00. This amount is refundable when you return the Parking Pass to FYC. - Gate key cards are in extremely limited supply at this time. The refundable deposit for a Key Card is $200.00. Rather than spending $200.00, you may use the Key Card in the mailbox, open the gate or restroom and return the Key Card to the mailbox (usually within five minutes). - Parking Pass stickers for 2019 will be available in early January per the Department of Beaches and Harbors. They said that the monitoring of parking passes will be relaxed most likely until late January. We will let everyone know when the stickers become available. Bring your Parking Pass to a Tuesday workday or a Saturday open house, and Uta will distribute the sticker to each member upon presentation of their Parking Pass. If you have any questions or want to discuss an item directly with me, you can email me at muriellesails@gmail.com. Thank you! Murielle Hamilton is from the French-speaking part of Switzerland and is the editor of this newsletter. She has ASA 101 and 105 certifications. She holds degrees in Dead Languages and Political Science but has worked most of her life in music and fashion. Art photography, skiing, and sailing are her current passions.